This edition first published in the UK by All Out Cricket Ltd.
A2 Yeoman Gate, Yeoman Way, Worthing BN13 3QZ. Last year All Out Cricket took over the publication of The Cricketers’ Who’s Who when there was uncertainty about its continued publication. They did excellent work under the circumstances in which they took over the publication but promised that they would overhaul the publication for 2012. That aside, there are many enjoyable categories under these profiles which include career highlights, cricketing and non-cricketing heroes, dream holidays, favourite book, their tips for players to reach the top, superstitions etc. Not all of it may be about cricket but it makes for an enjoyable and relaxing read. Full name, date of birth, teams represented, nicknames in places and squad numbers are also included and career statistics complete the player profile. The quality of the photos has also been improved. Players are named in chronological order rather than by county before team profiles of Scotland, The Netherlands and Unicorns complete the players’ pages. Umpires are again given very good coverage. Overseas players and likely tourists are not included as such an assignment would be so difficult to conduct given the many changes that occur and the players included are from lists given by the counties in mid-March. Each county is analysed at the front of the book with a profile of the coach and 2011 player statistics for both Championship and List A matches and the statistics make for impressive reading and include the number of fours and sixes hit as well as the strike rate in both formats of the game. A roll of honour which includes final placings in the County Championship, Clydesdale Bank and Friends Life Twenty20 completes this impressive book along with the First Class batting and bowling averages for 2011, fielding and wicketkeeping figures and a ratings chart. 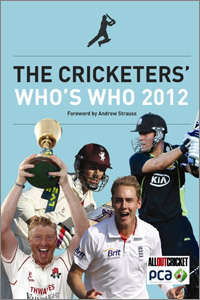 I am sure that, once again, The Cricketers’ Who’s Who 2012 will not only prove to be an invaluable reference book for all cricket fans but also a most enjoyable read.